Change is the only constant thing. And everyone loves it. We all also love WhatsApp which is our go-to messaging app. It has got many features that let us stay connected with friends and family. They have also brought new fun additions like GIFs, new Emojis, Status and more. Still, we need more to have the extra level of fun. When we talk about the coolest thing that everyone wants to change in their Android smartphone time to time, themes or fonts comes in the top of the list. That's why I think WhatsApp should give its users the option to switch theme and font. As WhatsApp officially has not provided those options, some MOD apps help in that case. You can find some of them by searching GBWhatsApp or YoWhatsApp or WhatsApp Plus on Google. Yes, by taking the help of a WhatsApp Mod, today we will change the font and theme in WhatsApp. Here are the below steps which can help you to switch theme or font in Android WhatsApp. We will go one by one. First, we will see how to change the font and then, switch between themes. So, without any further ado let's get started. How to Change Font in WhatsApp on any Android device? Most of the WhatsApp lovers wish to change the WhatsApp fonts to make it look more stylish. I'm one of them and maybe you too. It's obvious that you wish that as you're reading this part of this article. So, let you know that it's not a hard task. Here are the things you need: Android Mobile/Tablet and a WhatsApp Mod (YoWhatsApp or GB WhatsApp). It will be only the matter of few minutes. So, don't worry. Just follow these below steps. Uninstall official WhatsApp from your Android phone. We are going to install a Mod. So, you can't use one number in both the apps. So, we have uninstall the official one first. First, you need to download YoWhatsApp latest APK file. Install the APK file you have just downloaded. After installing it, open the app. Create an account as you do in the official WhatsApp app. When the verification is completed, tap on the top right corner. You see many options. Just tap on "YoMods." Then, scroll down and click on "Universal" > "Styles (Look and Feel)" > Font Style. You will see a list of many fonts with preview. Just tap on the font you want to apply. Press back button and come back to the Chats screen. You can see the Font is successfully applied to WhatsApp. Have fun changing the fonts in WhatsApp! Those above are the most straightforward way available to change or switch WhatsApp fonts. 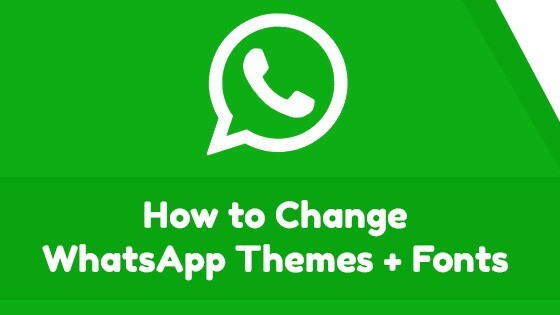 Now, it's time let you know how to change WhatsApp themes. So, let's dive into that. How to Change/Switch Themes in WhatsApp? Changing theme is as simple as we did change fonts. So, it's very easy. We just have to take the help of the YoWhatsApp MOD app. If you're in the quest changing your WhatsApp theme, then you are at the perfect place to get that. Just follow the below simple tutorial. Download and install the YoWhatsApp APK on your Android mobile. Install it as you install other apps. Register with your Mobile Number as same as you do in the default WhatsApp. Open YoWhatsApp > Press the Three Dots Icon > YoMods. Tap on "YoThemes" > Download YoThemes (themes store). You will see more than 3500 themes. Just tap on Download button and click OK. Yoooohoo!! You have successfully changed the WhatsApp theme. Continue changing the WhatsApp themes with YoMods and have fun! Choose your favorite color and get WhatsApp load with that. That's a cool thing. Isn't it? If you want to reset the Themes settings, it's easy in the YoThemes settings. Go to YoMods > YoThemes > Reset Preference. That's it. Hope you have enjoyed this guide to changing WhatsApp themes and fonts. This is probably the easiest you can find over the internet to these tweaks. Keep visiting CrunchyTricks for more like this.